An innovative green space along the Housatonic river to serve as a wedding venue for Cantina 229’s evolving business, as well as a ground for green markets, banquets and the general public to enjoy. Phase 1 will focus on two gardens, The Birch Garden and The Wedding Garden which will allow for serious progress to be made immediately, meaning this winter. Once installed, the gardens can be used to attract clientele, with the focus on weddings. These gardens will be described in greater detail below. With the right funding, this property has the potential to become the high line of the Housatonic and with that in mind, phase 2 of the project would develop the larger landscape of the property into a park, complete an urban farm, wildlife refuge, hiking trails, and a riverside dock. The Birch Garden will use reflections to create optical effects and beautiful moments. The side of the venue can be used as a window; a portal for guests to gaze out from within the building. Trickling water will be enchanting and the moss carpeted floor, majestic. Japanese inspired but uniquely American. A Berkshires landscape giving new context and a new perspective. Memorable, enchanting, simple, and beautiful; If you’ve ever been to Japan and visited the countries ancient temple gardens, you would use these words to describe them. Japanese gardens are world famous. Most people are familiar with their raked gravel, majestic ponds and fall colors of the Japanese maple. What we want to do is rather than recreate a Japanese garden, use the design fundamentals found in them and create something truly contemporary and unique to the location. Our garden will consist of entirely white birch, a native species to the Berkshires as well as native mosses and lichens. In essence the garden will be a fantasied version of something you’d find locally but unlike anything you would find in the wild. Position wise, this garden will use the architecture of the venue and the adjacent brick factory to create an intimate garden room, framed between two structures. The constant water flow form your well will feed the gardens pond and overflow from the pond will travel out of the Garden and down an engineered stream. Depending on the development of the venues interior, we’d like to propose the creation of a large rectangular window facing the garden (like the image above). 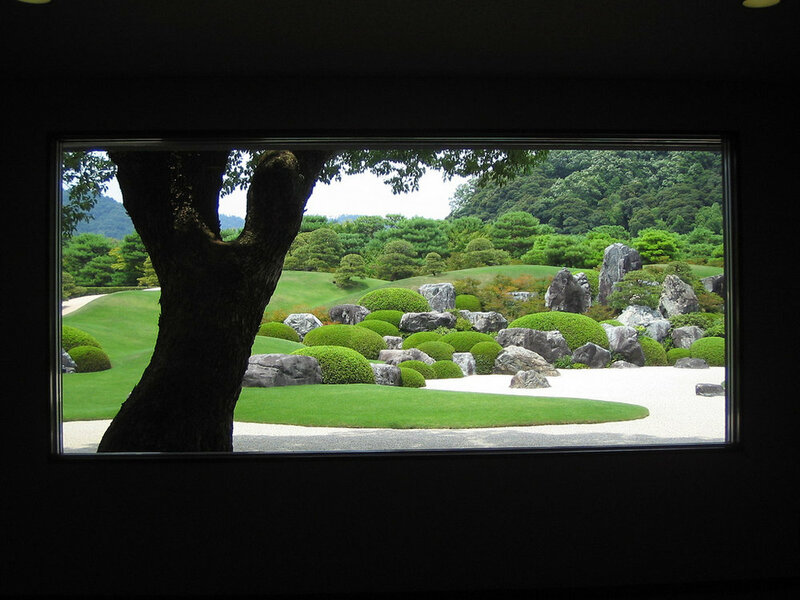 This is an ancient Japanese technique that directs the viewers attention to the garden; framing the landscape, like being in a movie theater. The Birch Garden will also be helpful on rainy days, so when incremental weather forces events inside, clients are still able to enjoy the landscape. On sunny days the viewing window will let lots of light in and create air flow. Finally the Birch Garden is designed to be postcard worthy, Intrinsically iconic., something people will want to take photos of and share. This will certainly bolster your online marketing/social media presents. We want weddings and with that in mind, we’ve strategically designed a garden to attract wedding clients. 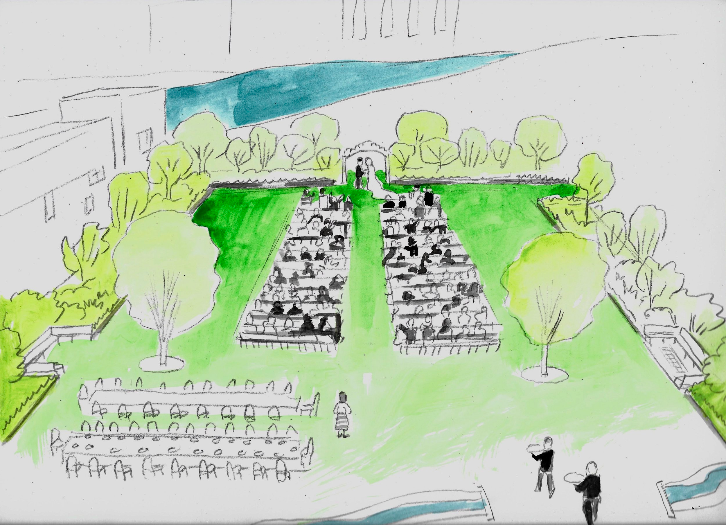 On paper the Wedding Garden is roughly 100ft by 120ft and runs from the back entrance of the venue, sideline to sideline, and ending at the view point of the Housatonic river. At it’s end sits an arbor which down the road, could lead to a path to the water. The garden is large enough to fit a sizable wedding with hundreds of guests and installs such as dinning tables, maybe a band, ect. As shown in the above image, the garden is complete with two garden rooms, (see image to the right.) The rooms are complete with seating and will make for perfect rest stops or hangouts for event guests. The Wedding Garden can also be described thematically as a ‘White Garden’ or ‘Moon Garden,’ using only white flowers plants or plants with foliage that stands out in the moonlight. 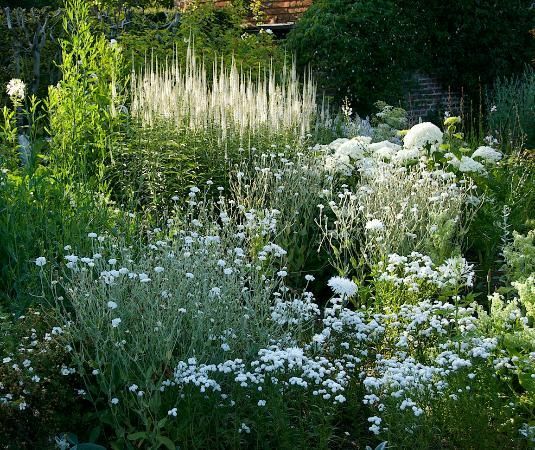 This style of garden has been championed by the English, specifically the White Garden at Sissinghurst Castle in Kent, which is one of the most famous gardens in the world, largely because of its theme. The Wedding Garden is defined by plant beds that will utilize a sophisticated composition of flowering trees, shrubs, perennials and grasses. There will be a formal edge and row of low grasses to contain a more contemporary plant arrangement. Naturalistic in deign in a similar way of the High Line. 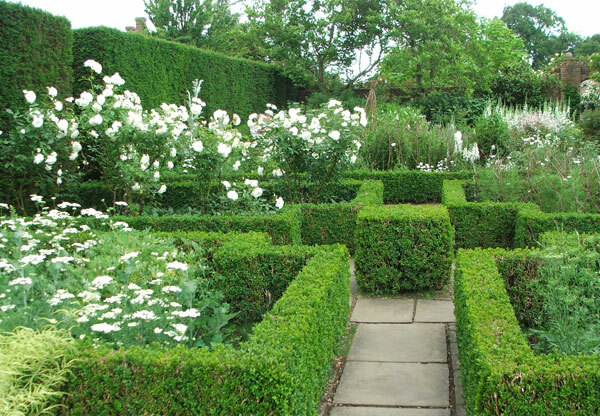 There is no theme of garden more suited for a wedding destination than a white garden. Almost every wedding has a florist that brings white flowers, so to have a permanent natural installation that gets more beautiful with age, will serve as a valuable asset. Your reputation will build, the word will get out — photos will be shared. Quickly Cantina Two (as we have been calling it) will become a premier location and not solely because of it’s food. A central wedding arbor adorned with white flowers which will frame a view of the river. 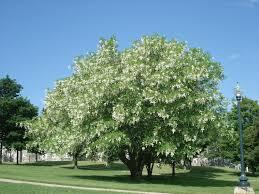 Fragrant white flowering shade trees that bloom at different times and decorate the floor with petals. Plenty of room for catering and events. Majestic plant compositions creating an inspiring dreamlike landscape. Whimsical natural forms combine hard edges architecture to create a very contemporary feel. A place for memorable experiences; an oasis for special occasions. Modern American landscape design meets historical English cottage garden. A gentle stream passing through the gardens. There is nothing like the sound of a bubbling brook. Phase two of the project would address the larger landscape and function of the property. The drawing above is a basic idea. It shows a path running from the Wedding Garden to a water front dock. Given how wet the land is, we’ve conceptualized a second pond which would collect the water from the Birch Pond which passing down a stream through the Wedding Garden. This second pond could then be used for irrigation or to attract wildlife. An urban farm can be implemented. A trail system and more. Does this drawing look like the High Line? No. The first two sections of the High Line cost $152 million alone and millions of people visit the High Line every year. “High Line of the Housatonic” would be a far more modest project but with serious implications in regards to localized impact on the community and local economy. With the right minds and funding this park can become internationally known. A new breath of life for Housatonic. This is what they’ve been waiting for. We view this as a tremendous opportunity both for you and for us. It’s obviously a huge move for you in your venture towards larger and more frequent wedding events. For us, this could serve as a game changing portfolio portfolio piece, putting us in a different category than just a company that does backyards and rooftops. In terms of a budget, the more money we can put into this project, the better it will turn out. What we’ve done so far is research and itemized expenses such as plants, and plant materials, and the water feature. The total for all that comes to about $70,000 to $90,000. This estimate does not include any payment for our design, project management, or labor. I think for us, we’d like to be paid something rather than take on ownership of part of the land or try to run a flower business (though we’re happy to help create a flower farm). We don’t need to be paid handsomely by any means and would be happy to work out a deal where we’re paid over a certain amount of time. I’m not sure where you stand on the overall funds for this project but all I can say is that our opinion is, if this thing can happen and happen in a real way, it could be huge and we’re certainly committed to being a part of it through the duration of its creation.